Cacciari, Massimo. ‘Nomads in Prison.’ Casabella 705 (2002): 106-108. Easterling, Keller. Extrastatecraft: the power of infrastructure space.London; New York: Verso, 2014. Negar Sanaan Bensi is an architect, educator and researcher. She received an honourable mention in National Archiprix 2011 in the Netherlands for her graduation project. She is a PhD researcher at TU Delft, as part of the research group Border Conditions and Territories and an UKNA fellow. Her research focuses on the relation between architecture and territory, infrastructure and inhabitation, specifically in the context of the Iranian Plateau and Middle East. She has taught at TU Delft, Tilburg Fontys Academy and IUST Tehran University and lectured at the University of Antwerp and International Institute for Asian Studies in Leiden. As a practicing architect she has collaborated with GFC, ZUS and Import Export Architects. She has contributed to several publications, among them the forthcoming books Adaptive Strategies for Water Heritage (Springer, 2018) and Inside/ Outside Islamic Art and Architecture: A Cartography of boundaries in and of the field (Bloomsbury, 2018) and the journal Volume 27. Francesco Marullo is an architect and educator. His research focuses on the relations between architecture, labour and the space of production. He holds a PhD in History and Theory of Architecture from TU Delft and he is an assistant professor at the UIC School of Architecture in Chicago. Previously, he taught at the Berlage Center, TU Delft, the Rotterdam Architecture Academy and collaborated with the Office for Metropolitan Architecture, DOGMA and the Urban Planning Department of the Roma Tre University. He is a founding member of the research collective The City as a Project, the think tank Behemoth Press and Matteo Mannini Architects. His work has been internationally exhibited and featured in various architectural publications. He contributed to recent volumes Into the Wide Open (dpr-barcelona, 2017), Counter-Signals (Other Forms, 2018), Work, Body, Leisure (Hatje Cantz, 2018) and co-authored the book Tehran: Life within Walls (Hatje Cantz, 2018). SANAAN BENSI, Negar; MARULLO, Francesco. 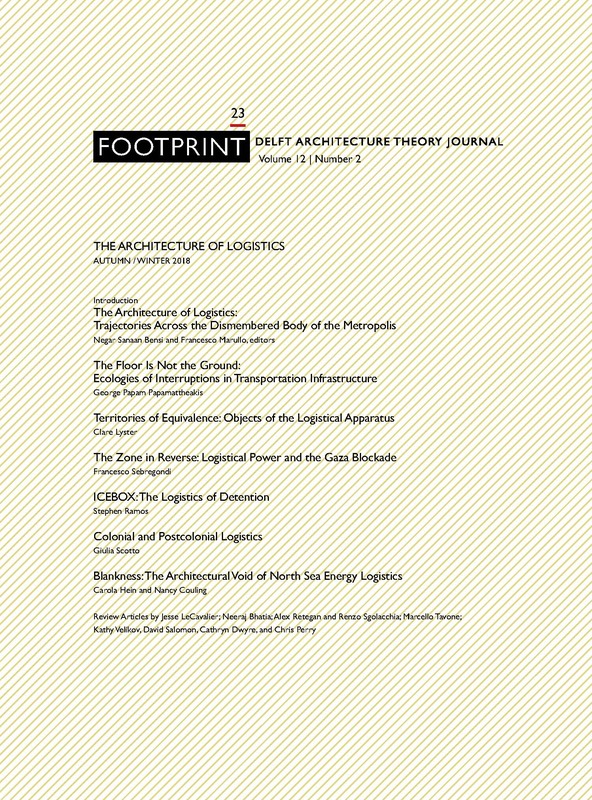 The Architecture of Logistics. FOOTPRINT, [S.l. ], p. 1-6, nov. 2018. ISSN 1875-1490. Available at: <https://journals.open.tudelft.nl/index.php/footprint/article/view/2784>. Date accessed: 21 apr. 2019. doi: https://doi.org/10.7480/footprint.12.2.2784.